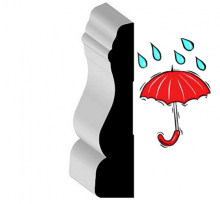 Elite Trimworks offers the full line of exterior PVC mouldings featuring popular profiles that are extruded, not cut, and coloured white, an important consideration for those who do not want to paint. PVC mouldings are more economical and more impact resistant than polyurethane trims. These Profiles are a fantastic compliment to any exterior project and like all our products require minimal maintenance and are impervious to moisture. If you know how to cut, or nail wood moulding, you'll know how to cut, nail, and finish PVC mouldings using standard carpentry tools. Most moulding profiles available at 16' lengths except for brick mould which is 17'. We can cut 16ft lengths in half to 8 feet, for ease of UPS shipping if requested.